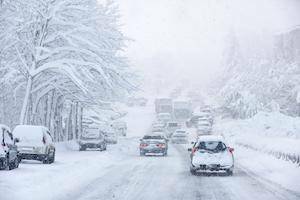 Driving becomes much more dangerous when there is snow or ice on the ground. Before driving anywhere, it is best to take some extra time to make sure defrosters, brakes, and mirrors are in good condition. Spending these extra few minutes to ensure that your vehicle’s systems are in working order can make a huge difference during the winter months. If a car is kept outside overnight, then chances are great that condensation and frost may form on the mirrors and car. It is wise to turn the car on at least five minutes before preparing to drive, and it is also a good idea to keeping a towel available to wipe away condensation and an ice scraper to remove any frost. Checking for snow or frost build-up on the headlight and taillights is a good way to take make sure other drivers can see your vehicle. Before the harsh winter weather sits in, it is a good idea to check the tread and pressure on tires, and make sure that you have at least a quarter of a tank of gas in your vehicle. Emergency equipment, such as a flashlight, blankets, food, water, and other necessities, should also be kept in the car in the event of an emergency. If the roads are snowy or icy, it is not a good idea to speed, since these conditions can make it difficult to control your vehicle. Allow for some extra time on the roads, and leave earlier to get to work, school, or other activities. It is also important to be more alert for pedestrians in colder weather, because extra time is needed to slow down to allow people to cross the street. As the holiday season approaches, the last way that anyone wants to end this year is by getting into in a car accident. There are many ways to take safety precautions, but even the safest driver can still become involved in a car crash. If you or a loved one has been injured in a car accident, Flaherty Law can help you recover compensation for your damages. To schedule a free consultation, please call a Will County personal injury attorney at 815-577-7500.